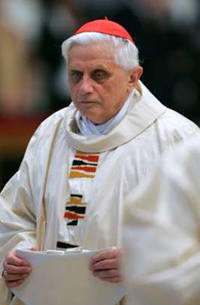 Cardinal Joseph Ratzinger making his first appearance as pope. 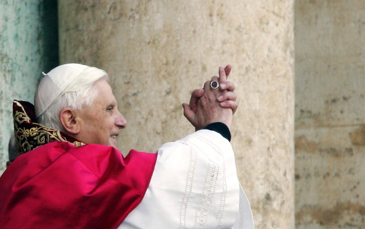 Taking the name Pope Benedict XVI, the 78-year-old German appeared on the balcony of St. Peter's Basilica. His arrival was greeted by loud cheers from the many thousands of pilgrims who had packed St. Peter's Square as news of his election spread across Rome. He was chosen on the third round of votes by the 115 cardinals meeting to select Pope John Paul II's successor. Giving a short address in Italian to the crowds gathered below the new Pope paid homage to his predecessor, and great friend, Pope John Paul II. "Dear brothers and sisters after the great Pope, John Paul II, the cardinals have elected me, a simple and humble worker in the Lord's vineyard," he said. "The fact that the Lord can work and act even with insufficient means consoles me, and above all I entrust myself to your prayers. "In the joy of the resurrected Lord, we go on with his help. He is going to help us and Mary will be on our side. Thank you," he added. Clad in white papal vestments and a short red cape, he then delivered the traditional "Urbi et Orbi" [to the City and the World] blessing to the city of Rome and the world. Vatican spokesman Joaquin Navarro-Valls said Pope Benedict XVI would dine with Roman Catholic cardinals later on Tuesday and celebrate a Mass with them in the Sistine Chapel on Wednesday morning at 0900 (0700 GMT). He will be inaugurated as the 265th pope on Sunday, the Vatican has announced. The new Pope had been one of the front runners in the papal election, which began on Monday when the 115 voting cardinals were sequestered in the Sistine Chapel for their secret conclave. 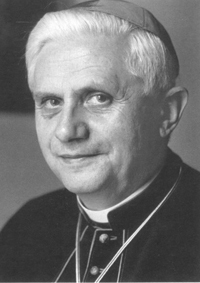 Pope Benedict XVI, who is the oldest pope for more than a century, was born in 1927 into a traditional farming family in Bavaria, Germany, although his father was a policeman. The future pope's studies at seminary were interrupted by World War II and his supporters say that his experiences under the Nazi regime convinced him that the Church had to stand up for truth and freedom. He is the first German Pope since the 11th Century. The BBC's Ray Furlong in Berlin says Cardinal Ratzinger's election as Pope will generate amazement and enthusiasm in Germany as well as concern among those who had hoped for a more liberal pontiff. For more than 20 years he was head of the congregation of the Doctrine of the Faith in the Vatican - the Vatican's guardian of orthodoxy. The BBC's William Horsley in Rome says his papacy is sure to continue John Paul II's strongly traditional interpretation of the Catholic faith, including opposition to abortion, homosexuality, priestly marriage and women priests. Our correspondent says that the homily he made at the Mass before the start of the Conclave in which he denounced all deviations from traditional church teachings as trickery and error, may have been decisive in winning him the title of Pope. 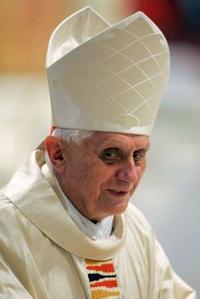 Cardinal Joseph Ratzinger, 78 - now to be known as Pope Benedict XVI - was the clear favourite to fill the vacancy left by John Paul II's death. As one of the most influential men in the Vatican, he presided over the Pope's funeral earlier this month and was said to be among the pontiff's closest friends. One of his first campaigns was against liberation theology, which had gained ground among priests in Latin America and elsewhere as a means of involving the Church in social activism and human rights issues. He has described homosexuality as a "tendency" towards an "intrinsic moral evil." During the US election campaign, he called for pro-choice politicians to be denied Communion. The eighth German to become Pope, he speaks 10 languages and is said to be an accomplished pianist with a preference for Beethoven. In 1966 he took a chair in dogmatic theology at the University of Tuebingen. 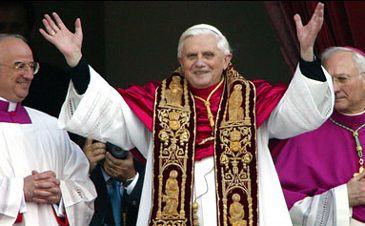 Cardinal Joseph Ratzinger newly elected as Pope Benedict. He was the right-hand man for the late Pope John Paul II. One incident in particular at Tuebingen, in which student protesters disrupted one of his lectures, seems to have particularly upset him. In his view, religion was being subordinated to a political ideology that he considered "tyrannical, brutal and cruel." "That experience made it clear to me that the abuse of faith had to be resisted precisely," he later wrote. 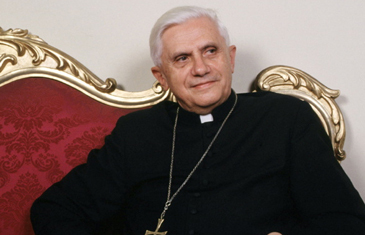 "I think if Cardinal Ratzinger was pope, a large distance could grow between the leadership of the Church and the faith," he predicted before the result was known. The cardinal is a "scientist" who "prefers intellectual discussions," says Mr. Cooper, whereas many Catholics want priests and bishops "who will touch the hearts."